The Director-General of the National Council for Arts and Culture made history on Thursday, July 26th, 2018 by addressing 32 countries from around the world on the need to change the narratives of culture in Nigeria. Otunba Olusegun Runsewe seized the historic moment to redefine Nigerian culture during a dinner boasting 32 ambassadors from all over the world with his message reaffirming the fact that culture is Nigeria’s new oil. Delivering a welcome address at the pre-INAC diplomatic dinner for ambassadors, a follow up to the International Arts and Crafts Expo, INAC (formerly called African Arts and Crafts Expo, AFAC) held at the Sheraton Hotel and Towers in Abuja, Runsewe said amongst other things that his idea is to further integrate Nigeria’s diverse cultures with countries from across the world with a view to leveraging on the abundant potentials of the Arts and Culture sector in Nigeria. Otunba Runsewe observed that the forthcoming Expo slated for November this year which has now been rechristened INAC will be organized at a salubrious, fully air-conditioned indoor exhibition hall in Abuja, devoid of the vagaries of weather conditions while additional components will be added in line with international standards. He was positive that countries from around the world will now have space to showcase their cultural endowments revealing that several countries have already indicated interest on dedicating specific days to showcase their unique cultural offerings. Runsewe also used the opportunity to introduce the novel idea of hosting members of the diplomatic community to a special night of music, dance, games, food and lots more adding that an event like the Diplomatic Community Night will create a platform for cultural exchanges between Nigeria and several countries from all over the world. The idea according to the NCAC helmsman is for the ambassadors to use the opportunity to enjoy Nigerian cuisines, traditional musical presentation, local games and several other culture-friendly entertainments Nigeria has to offer the world. 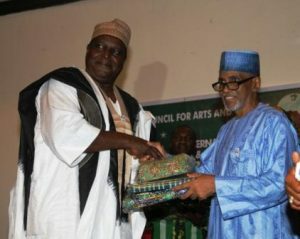 Treated to a sumptuous dinner, each of the 32 Envoys was also presented with unique NCAC branded souvenirs by Runsewe himself while decorating them with NCAC pinup crest in a symbolic move charging them to spread the good news about the new dispensation in Nigeria’s culture and living Arts industry. On attendance were High Commissioners representing countries like Cameroun, Angola, United States, Argentina, Norway, Mexico, Japan, Russia to mention a few.